P.S. 2011 Check back tomorrow. I will add a link to more personal photos I took a few weeks after 9-11-01 when I walked around ground zero. It was still burning that day and a week later I came down with my only case of pneumonia. We've been TiVoing the Revolution on The History Channel and really enjoy watching it. One of the episodes featured the military campaign of 1776 and that's the one that got me a little misty eyed and I couldn't go to bed until it ended (yes I do know how the war turns out). You see, in the span of about 45 days George Washington and the Continental Army rise from the dead that was the falling of two forts in NYC/NJ to win the 1st Battle of Trenton preserving the Army and our independence. The British and Washington knew how important the Continental Army was to our independence and without it, we'd go crawling back to Great Britain. Sure, the Declaration of Independence announced to the world about our birth as a country, but it is Washington and the Army that delivered it. In mid-November 1776, Washington loses New York by suffering a terrible defeat at Fort Washington, losing almost 3,000 troops. A few days later Fort Lee falls to the same British Army of regulars and Hessian's, giving them the key to the lower part of the Hudson River and NYC (you do remember how important rivers were for travel and communication). Washington and what's left of the Continental Army retreat all the way down through NJ to PA. British General Howe doesn't pursue because as the History Channel puts it "Convinced that the Americans were thoroughly beaten and that the Continental Congress would sue for peace, Howe did not pursue Washington, but merely established several outposts in New Jersey and settled down in winter quarters to wait for spring." Total defeat of the Army and the surrender of the new nation seemed within reach. but Howe underestimated Washington's resolve and his ability to keep the end goal in sight. As any American school girl knows, George Washington a nd the ragtag group of men and boys that formed the Continental Army re-crossed the Delaware River on Christmas Day 1776, not even 45 days after the defeat of NYC and surprised the Hessians in Trenton. The British lost almost 1,000 men and the overwhelming victory proves to the Continental Congress that the army can defeat British regulars and they therefore increased re-enlistments. George Washington kept the Declaration of Independence from becoming just another piece of paper by keeping his eye on the end game. Even after suffering a terrible defeat, Washington was still able to shift tactics and bring home a victory. How many of us in our jobs, when a project goes wrong, could use this leadership lesson to keep our eyes on the end goal and fix a strategy when something does not go according to plan. How about if you are in a dead-end job and you are stuck for just a little while longer? Or, as my friend Frank B. says, "when god gives you lemons, make some lemonade." That's exactly what Washington did in a span of 45 days to make sure the newly formed country saw its first birthday. And oh how that lemonade tastes with a couple of hot-dogs and fireworks. The agency I work for Connell Donatelli Inc is working with the Pentagon Memorial Fund to raise funds to build a memorial for the victims of the attack on the Pentagon on 9/11. I placed a banner on the left hand margin of my website with a link towards making a donation. If you have a website or blog and would like to put up an ad, please follow this link to a page where you can grab Pentagon Memorial Fund banners. 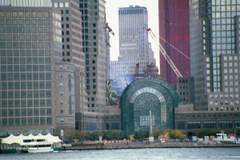 I of course was not located in Washington on 9/11 but just across the Hudson River from the World Trade Center in CSFBdirect's offices. On that day I was supposed to have a meeting with our online advertising agency Modem Media and AOL regarding our personal finance media deal in AOL's downtown offices at 9AM. I would have been just passing through via the Path that morning had my meeting not been canceled by my boss CMO Debra Isenberg who wanted to have a review of our YTD marketing expenses. Right before we were let go, we watched on TV as CNN started reporting the Pentagon's attack and it was then that we were dismissed to evacuate the area. As I was quickly escorting two co- workers out of the office to my car, we witnessed the first tower collapsing embedding shrieks of horror and the sight of people fainting forever in my memory. 9/11 is also the day that we found out we were pregnant with my second child. 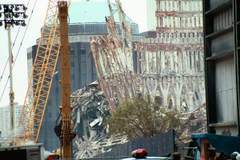 The picture here is from my personal file taken a few weeks after the attack on the WTC. Ok, it is the 4th of July so why shouldn't I participate in a little celebration on my site. Don't worry, I'll keep this short. In mid-November 1776, Washington loses New York by suffering a terrible defeat at Fort Washington, losing almost 3,000 troops. A few days later Fort Lee falls to the same British Army of regulars and Hessian's giving them the key to the lower part of the Hudson River and NYC (you do remember how important rivers were for travel and communication). Washington and what's left of the Continental Army retreat all the way down through NJ to PA. British General Howe doesn't pursue because as the History Channel puts it "Convinced that the Americans were thoroughly beaten and that the Continental Congress would sue for peace, Howe did not pursue Washington, but merely established several outposts in New Jersey and settled down in winter quarters to wait for spring." Total defeat of the Army and the surrender of the new nation seemed within reach. but Howe underestimated Washington's resolve and his ability to keep the end goal in sight. As any American school girl knows, George Washington a nd the ragtag group of men and boys that formed the Continental Army re-crossed the Delaware River on Christmas Day 1776, not even 45 days after the defeat of NYC and surprised the Hessians in Trenton. The British lost almost 1,000 men and the overwhelming victory proves to the Continental Congress that the army can defeat British regulars and increased re-enlistments. George Washington kept the Declaration of Independence from becoming just another piece of paper by keeping his eye on the end game. Even after suffering a terrible defeat, Washington was still able to shift tactics and bring home a victory. How many of us in our jobs, when a project goes wrong, could use this leadership lesson to keep our eyes on the end goal and fix a strategy when something does not go according to plan. How about if you are in a dead-end job and you are stuck for just a little while longer.